It’s been over a year since the fallout between Qatar and the Arab Quartet that is Egypt, Saudi Arabia, the United Arab Emirates and Bahrain. Qatar is struggling to appear unaffected by the crisis despite obvious political difficulties and growing economic problems. 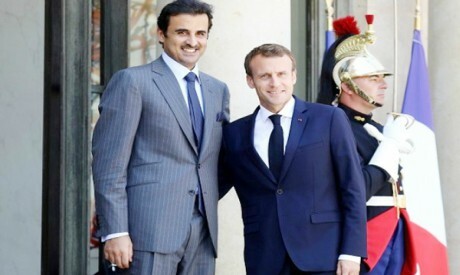 Thirteen months after Emir of Qatar Tamim bin Hamad Al-Thani signed a $12 billion deal to buy 36 F-15 fighter jets, he concluded a visit to President Emmanuel Macron in France and may soon fly to meet with Russian President Vladimir Putin. The main message Doha wants to deliver from its emir’s international visits is to appear unharmed by the Arab Quartet boycott, in effect since June 2017. Despite avoiding economic crises resulting from the fallout, Qatar is losing its Arab depth, which it has been claiming to defend for more than 20 years. Qatar’s literary awards are worthless without Arab literati, so are its museums without Egyptian, Iraqi and Moroccan intellectuals, and its universities without academics and students flocking from the boycotting countries. The Arab embargo is not confined to the Arab Quartet. Libya, Yemen and Syria are stepping in. Iraq is improving its relationship with Saudi Arabia and will not risk it for Doha. Arab countries are at war with the Muslim Brotherhood, supported by Qatar. Sudan is fighting alongside Saudi Arabia and the UAE and will not endanger its relationship with them for the sake of Doha. In short, Qatar’s status in the region is getting much more complicated. For years before the boycott went into effect, the Arab Quartet’s demands remained unchanged. They requested the end of Qatari meddling in their own affairs; the halt of support for terrorist organisations; and calming fears concerning Doha’s close relationship with Iran. Qatari institutions such as the Central Bank and oil and gas companies released their reports last month announcing Doha was not negatively affected by the embargo. The Qatari Ministry of Industry said industrial production doubled in comparison to the year before the boycott. This is possible, say some observers, since Qatar has very few activities outside the oil and gas sectors. Moreover, Qatari reports indicate agricultural production increased by 10 per cent. Such reports came out of a desert country whose people were never known for their agricultural approach. A portion of them, though, worked in fishing before shifting to the oil business. “The Arab boycott of Qatar is meant as a political, not an economic, embargo. The quartet didn’t expect the fallout will harm Doha economically since it has one of the largest natural gas reserves in the world,” said an Egyptian diplomat on condition of anonymity. Qatar has solid financial earnings. The Gulf state is the world’s biggest exporter of natural gas and its revenues from international investments are worth $335 billion. These two assets have enabled Doha to “withstand the boycott” as it claims. The economic damage is starting to surface, nonetheless. Qatar has managed to make up for the Saudi halt of food assistance, especially that of daily products, from other sources. It also imported thousands of livestock to achieve self-sufficiency. Before the quartet’s boycott, Qatar used to import $1.05 billion worth of food, including $309 million from Saudi Arabia and the UAE. Tehran has replaced Riyadh and Abu Dhabi as a source of food assistance. Commercial trade between Qatar and Iran has increased by $250 million during the past year. Qatar’s status will become increasingly difficult if US sanctions tighten on Iran, since the sanctions will make it hard for Tehran to continue trading with the rest of the world, including Qatar. Iran’s food supplies encouraged Qatar to remove the Arab Quartet’s products from its shopping shelves and to ban the import of dairy products from Saudi Arabia or a third party “for the safety of its consumers”, in the words of the Qatari Ministry of Economy and Commerce. Despite “the one-sided war Qatar fought and won”, said writer Mustafa Ebada, the country’s image is becoming increasingly shaken, especially after the head of the state-owned air carrier, Akbar Al-Baker, said the company was making losses for the second year in a row because of the Arab Quartet’s boycott. “We are trying to make up for these losses after the huge losses [in 2017],” Al-Baker told Reuters in June. Qatar Airways has lost the ability to fly to 18 destinations in the four countries that imposed the embargo. The Qatari carrier is also enduring longer flight routes and more fees after the elimination of Saudi airspace from its travel lines. To reach their European destinations, Qatari planes have to fly longer routes through Iran and Turkey. This means increased costs for the company, which translates to higher priced tickets for travellers, consequently decreasing the edge of competition for the Qatari airliner. As far as the Asian destinations are concerned, Qatar Airways is facing fierce competition on the part of two Emirati airlines that provide the same service at the same price, in addition to competition from some Asian companies that offer cheaper flight deals. Qatar Airways is expected to ask for financial assistance from the government if the current status quo is maintained. “We may not need government aid in the short term, but if the boycott remains we may have to resort to a campaign of shares to pour cash into the company,” Al-Baker said. Besides Qatar Airways, Al-Jazeera and beIN networks as well as cultural and educational Qatari establishments have always been a tool in the hands of Doha to polish its image abroad. In addition, Qatari development projects in the fields of sports and entertainment, in preparation to host the football World Cup 2022, are in limbo. The boycott is spreading fear among Asians working in Qatar. Human rights reports have been coming out in the past few years about the deteriorating status and living conditions of foreign workers in Qatar, especially after many died in a number of incidents for lack of safety measures. The decrease in the number of foreign employees working in Qatar, in fields ranging from construction to childcare, will result in a decline of services received by the three million Qataris that make up the country’s population. A shrinking market and worsening services will negatively affect Qatar’s ability to host the 2022 World Cup and strengthen the image of the Arab Quartet. There is no near end in sight for the crisis surrounding Qatar. If its oil institutions make consistent losses, Doha will be obliged to either change its policies or fall into a whirlwind of isolation that can scatter and dash Qatari aspirations.